Golden Moon which has utilized it's platform for year to get new faces out on the water. Shawn Ivie's Limitless would dethrone Golden Moon to become National Champions with 12 points in 5 races over 3 days. Bartz Schnieder's Expeditious in 2nd with 18, one point less than Brendan Busch's Spy vs Spy. Today was the first day of racing for the Express 37 Nationals, hosted by the BYC! 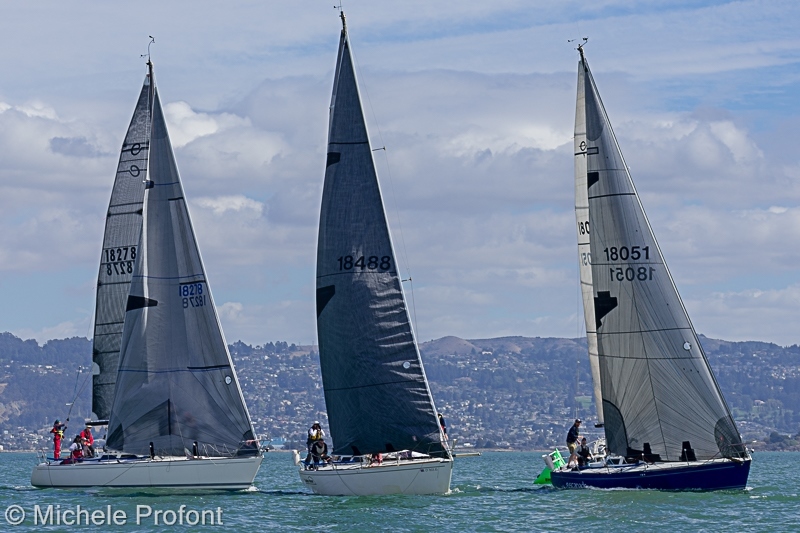 Twelve boats entered, some from Southern California (Thanks for making the trip, guys! ): Bullet, Eclipse, Elan, Escapade, Expeditious, Golden Moon, Limitless, Loca Motion, Mudshark, Snowy Owl, Stewball and Spy vs Spy. 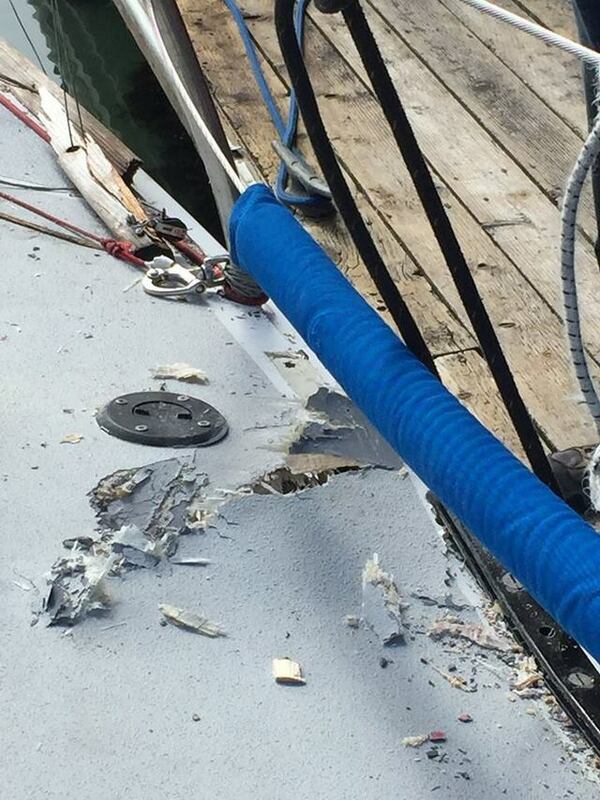 Unfortunately, a collision right before the start of the first race resulted in one boat retiring for the regatta. 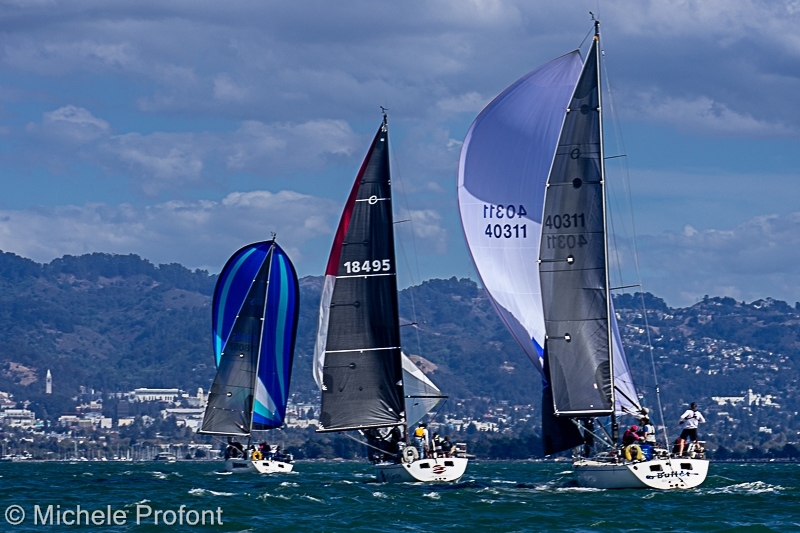 For the first race of the day, the fleet was sent on course #2: starting in the Berkeley circle, to a windward mark with an offset, to the leeward gate, twice around with a downwind finish. The wind was moderate at the start and most boats chose to start with their #1 jib while others started with their #3. 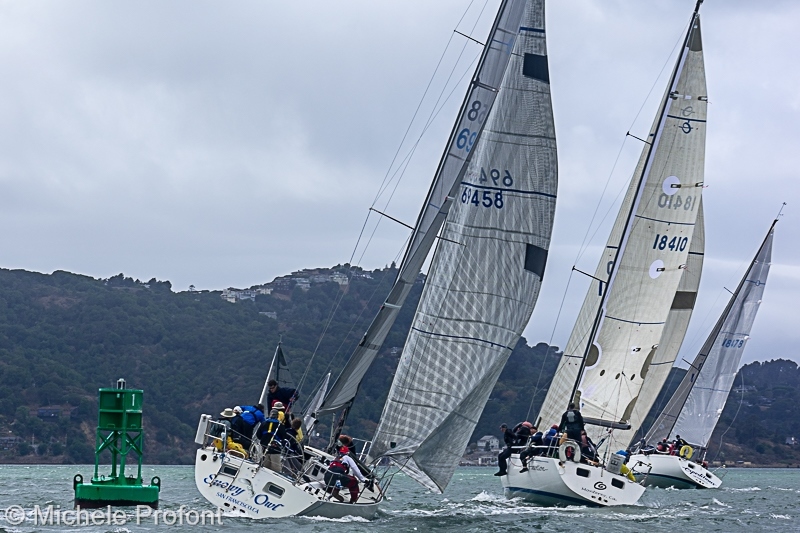 Boats who chose the pin end and stayed on the left side of the course were favored. 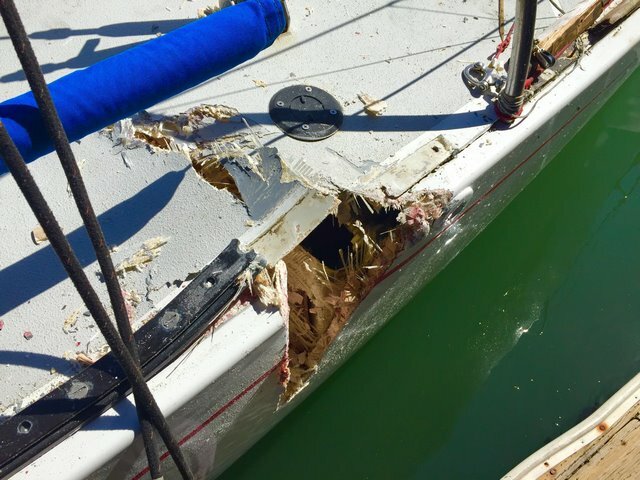 A wind hole on the upwind leg complicated the course for some boats. At the gate, the fleet split between the north and south gate. For the second race of the day, the fleet was again sent on course #2. By that time, the wind had built up and all boats started with their #3 jib. The pin still seemed favored in the dying flood. After day one, Limitless is leading, with Expeditious in second position and Stewball in third. 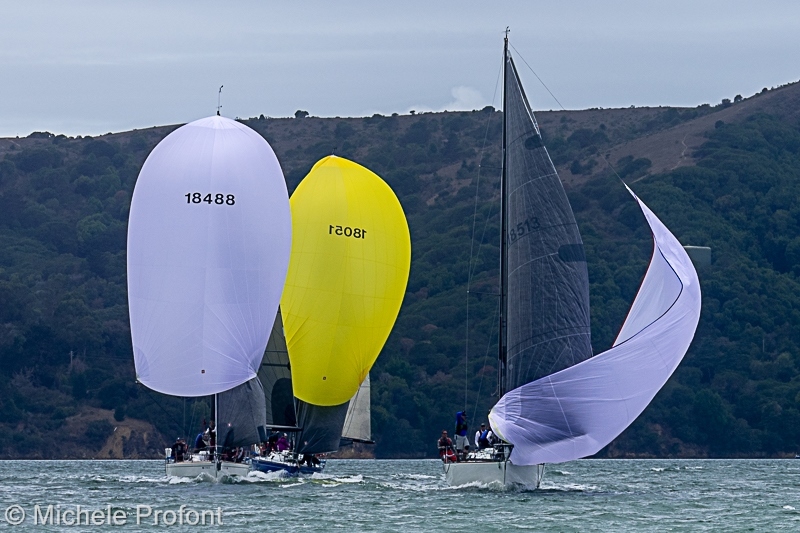 Second day of racing for the Express 37 Nationals, with 11 boats on the starting line. 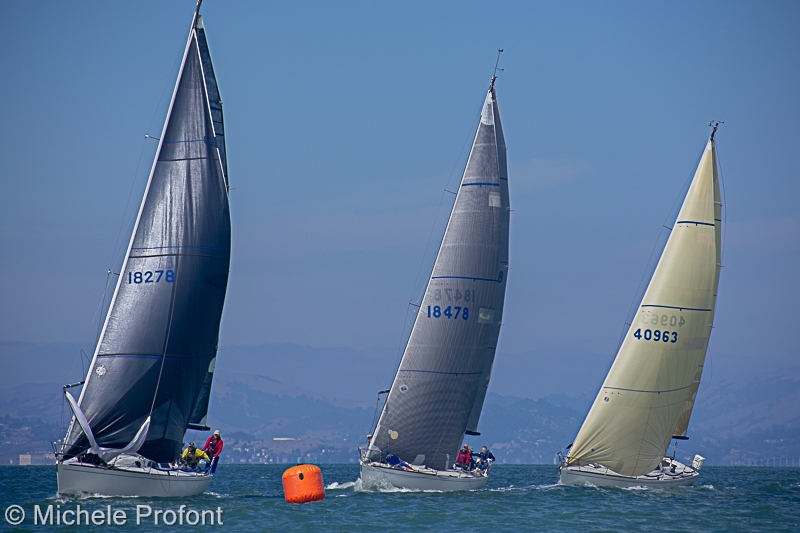 With the light and uncertain weather forecast, the fleet discussed course options with the race committee @Berkeley Yacht Club in the morning. 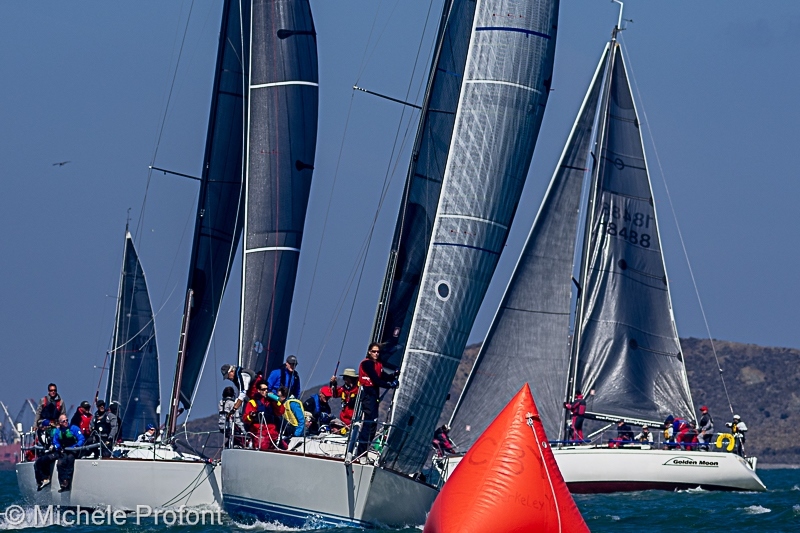 Eventually the fleet started on time and for the first race of the day, boats were sent on course #2: to an upwind buoy with offset, back to a gate, twice around with a downwind finish. 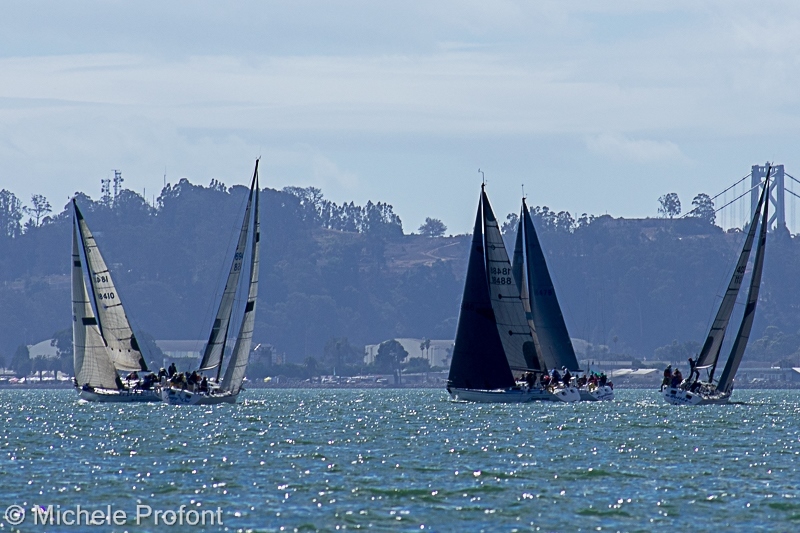 Starting in the Berkeley circle, wind was around 8-10knots, and all boats started with their #1 jibs. It was flooding all day and calling the lay line was tricky. On the last downwind leg, the wind was very shifty, and a few boats had to hoist their jibs to make it across the finish line. Congrats to LocaMotion who got the gun on race 1! 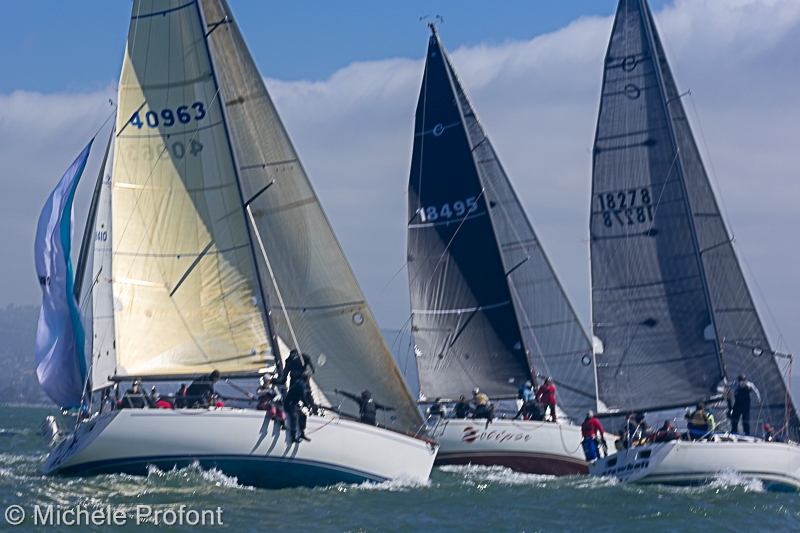 Before race #2, the aim was to get out of a large dead spot area off the Berkeley circle and the fleet enjoyed a long lunch break motoring further West on the bay. 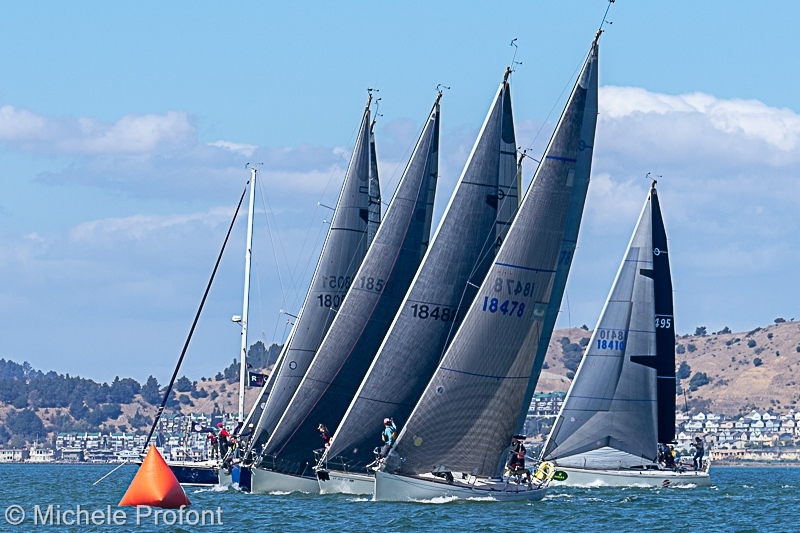 Eventually, the call was made for race #5: to Little Harding on starboard, to Angel Island on starboard, rounding G1 by Southampton on port, back to AI, LH on starboard and to the downwind finish. By that time, the wind had picked up to 10-12 knots, with all boats starting with their #1 jibs. After the start, a few boats tacked quickly to the right side of the course for clear air. Hugging the Angel Island shore proved to be favored, and boats who stayed further inside made big gains. Despite the flood, several boats over-stood Little Harding. Going through Raccoon, playing the tides was important. After rounding G1 to port, the fleet headed back through Racoon straight. With the ebb starting, there were big gains to be made by staying close to shore. A few boats hoisted their #1 jibs again after rounding G1. In Racoon, the wind was very shifty with gusts in the upper 10s. 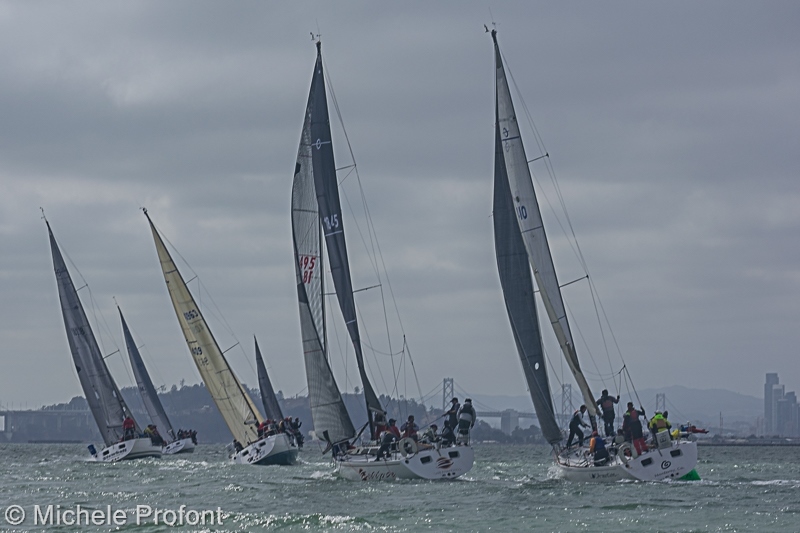 But boats with their #1 jibs eventually had advantage when the wind lightened up leaving the straight. Heading back to Little Harding, a few boats stayed way out on the right side trying to take advantage of the building ebb. After the final rounding, boats engaged in their last downwind leg to the finish, with a few boats finishing within inches of each others. Congrats to Spy vs Spy for taking the win on race #2! After day 2, the fleet is tight with Limitless leading, Spy vs Spy 2nd and Expeditious 3rd. Happy evening to all racers and to the BYC, and good luck to all boats tomorrow for the final day of racing! For the last day of the Nationals, very light conditions on the Berkeley circle. After a long hour of postponement during which a few crew went for a refreshing bath, wind picked up to 8-10 knots and the call was finally made for course #2: to an upwind buoy with offset, twice around with a downwind finish. All boats had their #1 up for the start. 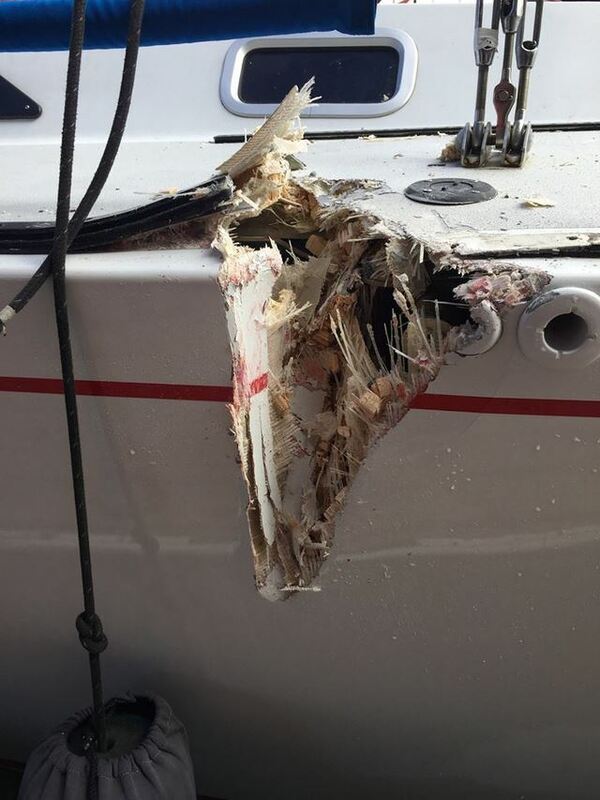 The upwind mark rounding was quite tight, with many “Starboard” calls to be heard. Eventually, the fleet split between the North and South Gate. With breeze building, a few boats switched to their #3 jibs. After one more upwind rounding, boats made their way back to the finish line. Another tight race for the fleet with several boats finishing within inches of each others. Due to the delayed start, the RC called it a day and the second race was to the dock and the bar! Congrats to Golden Moon who got the gun on this last race! After that, the fleet enjoyed delicious food and beverages at the club before the award ceremony started. Huge congrats to Limitless for taking the overall win in the 2018 Express 37 Nationals!! Congrats as well to Expeditious for their second place and Spy vs Spy for their third place finish! Massive thank you as well to the Berkeley Yacht Club for hosting and treating us so well, and to all the crews and owners for getting out on the water! It’s been an epic year with 12 boats signed up: Bullet, Eclipse, Elan, Escapade, Expeditious, Golden Moon, Limitless, LocaMotion, Mudshark, Snowy Owl, Spy vs Spy and Stewball! Nationals. The theory states "That two bodies of equal mass can occupy the same space at the same time"
In this case, Elan and an Mudshark tangled up in prestart maneuvers with Elan getting the most bang for the buck.